Oil and natural gas undergo a different process of fossil fuel formation compared to coal. These two substances tend to occur together and the process for forming them is the same. As with coal the formation conditions need to be very specific. Oil and natural gas are formed from the remains of tiny aquatic animals and plants. As with coal, vast quantities of these organisms are required to make a viable deposit of oil or gas. These organisms, once dead, would have sunk to the bottom of the body of water they were living in, been covered in silt and mud, and then started to decay anaerobically See the description on the formation of coal for the difference between aerobic and anaerobic environments and their effect on decay. As such, it is reasonable to assume that the bodies of water that these micro-organisms were living in were fairly stagnant, as strong currents in water both improve aeration and prevent the laying down of very thick layers of organic material in the one location. 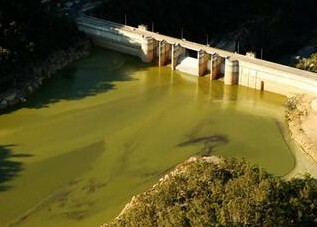 The image shows an algal bloom in a stagnant waterway. See the vast quantity of organic material that can be produced in a short time. With no current to sweep away the dead organisms, a thick layer of debris would quickly build up at the bottom of the water body. The anaerobic decay of these micro-organisms means that while their cellular structures break down, the carbon chains that are the foundation of their bodies do not. As with coal formation time, pressure and heat drive out other substances such as water leaving mostly the carbon chains behind. Why is oil a liquid? Fossil Fuel Formation: Comparing Coal and Oil Structures. Coal contains massive molecules of carbon rings. These are from the plant fibres which can be very long, sometimes metres long or more. They also are often twisted around each other giving added solidity. The carbon chains in oil are tiny by comparison. They are the structural remains of microscopic organisms and so they are ALL very small, though there is a great variety within any crude oil sample. It is this the relatively small molecule size and the chemical structure of the carbon chains in oil that make it a liquid. Natural gas such as methane is merely the tiniest pieces (fractions) of the oil molecules. These are so small that they do not stick together well enough to be a liquid, and so they are gaseous. For this reason Natural Gas is almost always found with crude oil. Natural Gas can sometimes be found on its own (meaning only the tiniest molecules of oil were formed). Oil is always accompanied by some natural gas. What is the process of oil forming? Since algal blooms are often toxic to animal life in the water body, it is reasonable to assume that at least some of the oil comes from animal remains. As more silt and mud is laid down, more layers of rock are added on top of the organic matter layer. Volcanic activity may also be adding extra layers of rock on top of the organic layer. This is taking millions and millions of years. The extra weight of the rock as well as some heating from beneath the crust of the earth are helping to drive water out of the oil-to-be. NOTE: the reason the rock layers are not flat is because they are being pushed sideways as well as down. This is coming from the movement of the tectonic plates that make up the earth’s crust. Let’s assume now that the organic matter has been squeezed and heated enough to break it down into something resembling crude oil. Since it is now in a liquid state, the crude can move. How does oil collect in vast amounts but in small areas? It might seem reasonable to conclude that there should be a thin layer of oil spread thinly in the majority of places. However, crude oil and natural gas are concentrated in large deposits in some areas but are absent in others. Why? This last step of fossil fuel formation involves porous and non-porous rock layers. A porous layer is one that contains lots of little holes in it, like a sponge. Basalt, a volcanic rock formed from rapidly cooling lava, is one such rock. Non-porous rocks do not have these holes in them, but are solid. Geologists are able to predict probable locations for oil from examining the structure of rock layers and then test-drill in likely areas. Not all probable locations contain commercially viable oil reserves. Some locations will have no oil or gas, some will have tiny amounts, and yet others will have the oil present but still trapped inside porous rock layers such as oil shale. Only the areas where large reserves of liquid oil are present are generally commercially viable to drill. These locations may be on land or under the sea. The earth’s crust plates are constantly on the move, and the oil reserves move with them. The reason a lot of the oil drilling occurs at sea is simply because the majority of the crust of the planet, under which the oil is located, is covered by water. It is a testament to our dependence on this source of fossil fuel that it is economically viable to go to the extreme trouble and expense of building and maintaining these structures.